During a morning leadership meeting I attended before church a week ago, much of the discussion focused on a recent controversial change in church policy. I took a risk in expressing my belief that, whatever the intentions and reasoning behind the policy change, the larger challenge remained for each of us to reach out in love and inclusion to those who feel marginalized or hurt. I expressed my conviction that ministry is a higher calling than judgement. At the time, this man’s disdainful comment felt like a sucker punch aimed at people whose experiences he truly didn’t understand. After further conversation with him and with a few others after the meeting, my heart ached so much that I burst into tears and rushed outside to gather myself for a few minutes before returning to attend the worship service with my wife and kids. While I’ve always felt a yearning for God, and while I’ve tried to follow the teachings of my church to the best of my ability, certain convictions or witnesses haven’t come to me—and it isn’t for lack of trying. I think my experience is probably genuinely mystifying to people who have experienced more direct and clear answers to their prayers, for people who see the world in black and white, or for people who experience faith in a very straightforward way. They might think that I’m not trying hard enough, praying in the right way, approaching God with enough willingness to follow His answers, or exerting enough “real” faith. And although I’m certain that I have room for improvement, those evaluations of me are so very, very unfair. Although I have lots of room for growth, I put a lot of devotion into my spiritual life. I read, I pray, I fast, I attend worship services. I serve. I love. Like so many good people in the church, I try to minister to others, and to keep the promises I’ve made to God. I don’t say these things to praise myself; I’m just clarifying that I’m not looking for an easy path, or for excuses to sin (as some people have suspected when they’ve learned of my doubts). Yet despite these efforts for many years, I still have many questions that remain unanswered. In the church I attend, we tend to like things that are black and white (we’re certainly not alone in this tendency). We’re uncomfortable with ambiguity. We don’t talk a lot about the complexity of communication with the divine, about what to do when good people get opposing answers, or about the times when God doesn’t witness to us that a commonly accepted teaching or practice is “true.” So we tend to privilege and emphasize the language of certainty, while pitying, judging, or getting uncomfortable with those who doubt. “Sometimes I think we don’t create a very hospitable climate for questions…. Sometimes we give people the very clear message that there’s something wrong with them if they don’t know something already, or if they don’t see it the same way…. So people lie. They say they understand when they really don’t. Or they say they agree when they really don’t. Or they find one point they can agree on and swallow the four points they disagree on. Or they suppress the perfectly wonderful questions they have, because they’re afraid that the questions may sound accusatory or faithless. As a result, no miracles happen…. If we don’t have questions, there won’t be any miracles for us” (Disciples, pp. 229-230, emphasis added). As sincere as they are in their loving desires, some of the leaders in my church seem to vacillate in their responses to those of us who still lack a certain level of knowledge, clarity, or conviction. On the one hand, we’re told that we’re needed and that there’s a place for us in the church. I’ve been a thankful recipient of such healing affirmation and inclusiveness. On the other hand, some church leaders seem to express increased exasperation with those of us who still have questions. We’re sometimes spoken to (or about) in a way that is invalidating, blaming, and defensive. Sometimes we’re given answers that evade our questions. At other times we’re told that we’re not doing it right. We’re treated as if we’re trying to rebel, when we’re just longing to reconcile our understanding of eternal things. We’re told not to “unplug the spotlight,” and to “doubt our doubts.” I understand the logic behind this advice, and I see some wisdom in it too. But for those of us who aren’t trying to unplug anything, who are continually striving, and who still have deep questions that aren’t getting addressed, church becomes a very mixed experience. Now, on top of our struggles, we’re judged or marginalized as well, because apparently our very sincere and continued efforts aren’t good enough. Believe me, I’d love for my questions and struggles to be cleared up too. So, asks a member my church, why don’t I just leave? Why do people like me stay? Because, despite our lack of certain convictions, we still love God, and He loves us. Because we need God, and the “body of Christ” isn’t complete without any of us. Because “it is not the will of your Father which is in heaven that one of these little ones should perish” (Matthew 18:14). Because we see His love reflected in many of the teachings and practices of the church, and in the marvelous faces and lives of many of its members. Because it’s not black and white. Because the church is meant for us as much as it is for people who possess more certainty or different viewpoints. Because the church is meant for all of us. Because, even if we’re not sure that all that is taught in the church is 100% true, we know that we are brought closer to God by many of its teachings, and that our communion with others in the church setting has deep spiritual value. Because, despite the human frailty that is nearly constantly evident in both ourselves and in others (including church leaders), we’re trying extend the same patience, mercy, and forgiveness that we so desperately need to receive. Because when we disagree, and despite our many differences, we still want to sustain each other in our common desire to know and love God more fully. Because we want to serve, stretch, love, and grow toward our divine potential, and we need each other’s help in the process. Because we know that our personal worship and relationship with the divine is complemented by learning to live together in love. Because we too are God’s children. Because God wants us here, even if some people would prefer for us to take our questions and leave. I don’t know that certain teachings of the church are exactly God’s will. There are some things that I’ll likely never agree with. I do have faith that God works (as well as He can) through this church and its leaders, among the many other places that His love is made manifest in the world. I also accept that well-intentioned people whom God has called are still subject to human frailty in judgement, perception, speech, and action. This is as true of me as it is of anyone. Notwithstanding the difficulty of trusting a church so full of human frailty (no different from any other organization), these things don’t matter as much to me as they used to. These days I’m trying to focus less on the inevitable vexing human elements in the church, and less on the “answers” that haven’t been forthcoming so far. I’m trying to focus more on the things that build my faith: God’s incredible love for me, my family, and all humankind. I’m trying to focus on the most simple version of the gospel: Christ’s invitation for us to love God and to love one another. I’m trying to leave judgment entirely to God (although I don’t think “judge” is His chosen title or primary role; His chosen title and primary relationship with us is as our loving Father). When things taught in the church draw me closer to God, I cherish them. When something taught in the church causes me pain, confusion, or doubt, I’m trying to practice patience and graciousness. I’m trying to follow the apostle Paul’s counsel to not place my trust “in the wisdom of men, but in the power of God.” Paul also taught that even though prophesies would fail and knowledge would vanish away, one thing would never fail: Christ and his loving charity for all of us. Even though I don’t know that certain things are “true” in the same way that many in my church sincerely profess, I feel blessed in countless ways by my membership there, and by many of its lovely people. Is there a place for me at church? I hope so. I have so much to learn from everyone there. And, like all of God’s children, I have a lot of love, devotion, insight, and sweetness to offer. I hope that you and I can join together in the great work of love rendered by the church and its beautifully diverse people. It would be a shame if any of us missed out on each other. P.S. If you know someone who can resonate with this message, please share it with them by clicking on the social medial buttons below! Also, I’m always interested in hearing your comments. Want to get my blog posts in your email? Hooray! Go ahead and put your name and email in the form below and I’ll send ’em your way. This was beautifully written. You expressed so wonderfully how I am feeling. Glad to know we are out there. Thank you. You’re welcome, Brecken. You definitely are not alone. I left the church several years ago, but having been a member for many years, I still have many friends who are faithful latter-day saints, and I get a lot of articles on staying faithful through hardships, etc. This is one of only two such that I have read that isn’t fundamentally condescending to those who disagree with church policies or who struggle with their faith, whether they remain in fellowship or not. It is beautifully written, and touches on some of the critical failures in the social structure of the Mormon church that have little or nothing to do with doctrines. My decision to leave the church was made only after many hours of prayer, fasting, visiting the temple, consulting with the bishop, and receiving a priesthood blessing from him. I did not leave because I didn’t want to live by the church standards anymore, or because I was divorced, or because it was inconvenient, as several (arrogant) church members assume. I understand that there are others who go through the same struggles I went to, and who come to a different conclusion than I did. I respect that. And likewise I expect my decision to be respected and not met with a condescending “well, we still love you,” and that knowing look of “I know better than you.” No one knows better than me what is best for me. And if you don’t “still love me,” then you never really did. I hear you, Anna. I agree with you that each one of us ultimately knows best what path we need to take regarding church and spirituality. Unfortunately, it is so easy to be arrogant or condescending rather than truly respecting another person’s path and admitting that we don’t have all the answers. Best wishes on your path! Thank you. I haven’t been active in my church in many years because I felt I was found wanting in my faith. I remember a song from childhood that said “faith is like a little seed, plant it it will grow” and while that song has it right it isn’t completely correct when you plant a seed you have to give it sunlight and water and food to nourish its growth faith is the same thing I planted my seed of faith and couldn’t find help with the nourishment it needed to grow. So as time went on my faith didn’t grow as I was singled out and pushed away by the leaders of my church because i asked uncomfortable questions or had concerns about teachings. So my faith dwindled and died. Sercomstances on my life have led me to wanting the community of my faith but fearing a repeat of the past. Your article has made me want to try harder to find my place in my church. So thank you from the bottom of my heart. Becky, it’s notable to me that you mention that particular song. My husband and I often talk about how it is misleading that the song defines faith as “knowing” the sun will rise, etc. They could have just as easily said “believing”. It seems like a prime example of our tendency in the church to create certainty out of things that weren’t necessarily meant to be simple. The frequent use of the word “know” can be alienating to many. I hope you can find a path back that strikes a comfortable balance between what you know and what you believe or hope. To live with faith means to live with a certain degree of uncertainty. You might want to take a look at “The Crucible of Doubt” by Terryl & Fiona Givens. It is excellent. It does take courage to “try again,” doesn’t it? It’s vulnerable to risk disappointment. Yet I hear your longing to find a sense of community. My heart and prayers are with you as you move forward. More importantly, I believe that God can cradle and shelter you, even on the occasions when those who are supposed to represent Him may fall short of His loving grace. Best wishes in your journey! Thank you for this insightful and tender essay. You eloquently expressed the difficulties of being a faithful member of the LDS Church without having all the answers. My ward is full of good, striving people, all of different levels of faith and relationship to God. It isn’t about us versus them or who is sure and “unsure”. It isn’t about being “faithful yet unsure”, amidst a silent judging majority. I loved the quote you shared. We are all imperfect and on a journey to something better, but the renewal is a work in progress. The greater majority mask their insecurities in judgement and pride, it is the nature of fallen man. So in my case, very little of this has to do with my sureness about certain doctrines, but rather in my natural sinful state. As I seek out God and His Love and Light, on the best of days I reflect that back to the people I know. On the worst days I am full of discouragement and despair and judgement. The cycle repeats itself over and over. If I fail to honestly acknowledge that this is the case for everyone I attend church with, my life becomes dismally self-centered, and I feel that everyone, even those who really love me, are against me. I think one of the greatest ways that we find grace in the LDS Church or any church is when we get out there, throw all of our efforts in the mix with a bunch of other people who are doing the same thing, imperfectly, and then God somehow still helps us to have a faith experience, drawing us closer to Him. When you think about all that can go wrong, isn’t this a miraculous thing! I’m glad you have decided to stay and continue to be part of the body of Christ. My best wishes for you and all those you love! I think you’re really on to something here. I too feel the tension (within myself) between reflecting God’s Love on my best days and feeling discouraged and judgmental on my worst days. Thank you for your encouragement! On any internet forum, it’s easy to forget that there are REAL people writing these words and comments–but your response, like several others here, reflected real listening and kindness. Thank you! Amen!! I feel exactly as you do. I feel like the larger struggle for me (beyond all of the eternal questions at times) is trying to extend love and compassion to those who can be so harsh. I know need to, because I am a disciple of Christ. It can just be so difficult. Thanks for letting me know I am not alone. Thank you for this article. 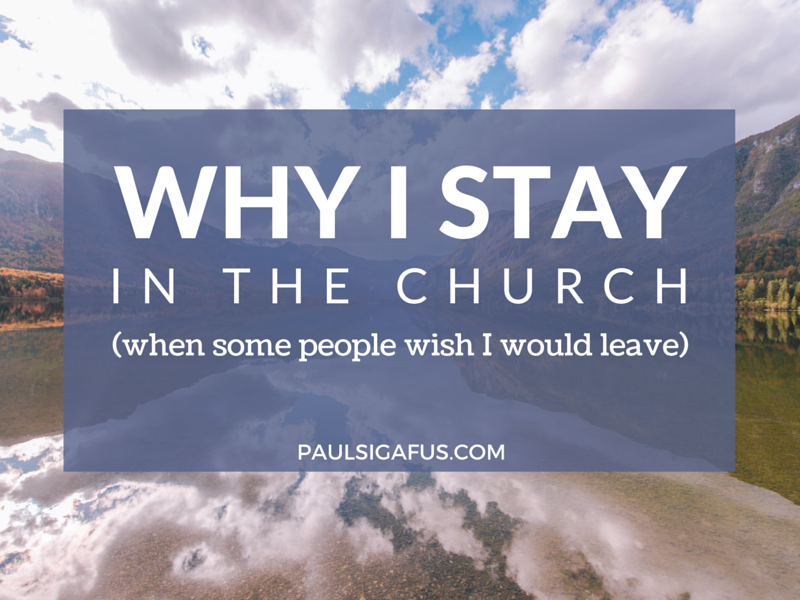 I have previously had those same thoughts: “if you don’t like the church, why don’t you leave?” . But, your post has reminded me that everyone has different spiritual gifts. I may not struggle with my faith, where others are left just “to believe on their words”. Thanks, Melissa. We do have different gifts, don’t we? And it’s such an important thing for all of us to be open to receiving what each person has to offer. Thank you for your vulnerability in sharing this. I read it and couldn’t help but cry because I thought, “finally someone who gets it!” The love and sincerity I felt is something I wish I felt from all members when speaking to, and about those who have doubts or those who are hurting because of recent changes. The world needs more people like you! You’re welcome, Tracy. Isn’t it interesting how we can all lift each other, even when we haven’t met? To hear tonight as I was struggling with this very concept this morning. I think a lot of us have these questions, Leanna. You’re not alone! Paul, it is so lovely to read you words and remember how kind and loving you have been since I met you during our freshman year at BYU. You are a light to all who know you. Thank you for your thoughts. Who knew life and faith would get so complicated? I’ve had my own journeys of faith as well and have also come to the conclusion that loving God and others is the most important thing we can learn to do here. Keep sharing your wonderful thoughts! You are amazing! That’s really sweet of you to say, Rachel–thank you. So glad that you enjoyed my post! Paul, what a fine man you are and how eloquent! Sorry your search for truth has brought pain and misunderstanding. The black and white world is unbending, judgmental, and unforgiving…nothing like Christ. You are not part of that world. Thank you, Darcy. You’re right, I have no desire to be part of the black and white world; living in full color is so much more joyful! Have a Happy Thanksgiving! Some people need black and white because that gives them their sense of security. Life is so much about shades of grey and I want to support you in that belief. I think God would want us to question, dialogue and discuss our differences. What is important is to always find those that accept us just for who we are and put our energy into those relationships and let go of those that are judgmental and hurtful to our souls. I believe that is what God would want us to do. I hope this is helpful. I couldn’t agree with you more, Hildie! Thank you for supporting me (and so many others out there who don’t live in a world of black and white). I love you and your family so much, Paul. Who could ever want you to leave? What a wonderful affirmation, David. I think some people do feel threatened/frightened when people address other viewpoints or questions. Our opportunity is to make room for each other and to learn how to talk about differences in respectful, loving ways. You said: “Although I have lots of room for growth, I put a lot of devotion into my spiritual life. I read, I pray, I fast, I attend worship services. I serve. I love. Like so many good people in the church, I try to minister to others, and to keep the promises I’ve made to God.” I’ve a problem with this. See, what you’re describing is Christianity. Also a couple of other non-Christian religions. What it is not is Mormonism. Mormons don’t have “worship services.” I’ve been to many worship services–Unitarian, Presbyterian, Methodist, Orthodox, and a few others. Worship services make you feel good that you’ve attended. They nourish. I have never, in 59 years of faithful attendance in Mormonism, felt nourished in “sacrament meeting,” the mind-numbing meeting about self-affirmation and praise of Joseph Smith. There is no ministering, only judgment, sometimes harsh, of those who don’t conform. Although I’ve looked thoroughly at other religions in order to find a replacement for the Mormonism I left, I feel better off without one. My worship service is a hike along the river or in a wood, my sacrament a glass of red wine or a pint of beer, my communion a grilled cheese sandwich. Rather than send my money off to an organization that fails to account for it, I provide money directly to the local poor, giving to and helping those in need who I encounter every day right in my own town. These things make me feel enriched and closer to God. Sacrament meeting makes me feel bad and unnerved. It makes me feel dull, like I should be somewhere else–anyplace else, like my time would be better spent in the foyer on my smart phone. (Is this why the foyer is full of Mormons on smart phones? Think about it.) Mormonism is a sad and bitter place to go, and represents years wasted, money I will never see again. I appreciate the words, but they’re falling on cynical ears. I hear you, Michael. Going to church for so many years without feeling uplifted is a huge burden. I’m truly glad to know that you’ve found your own way of feeling close to God and helping those around you. I have no doubt that your worship is every bit as valid as anyone else’s. Thanks for sharing your experience! I have to agree that Mormon “sacrament meetings” are in no way anything like the “worship services” I now attend at a Baptist church. I spent over 30 years in the church as a dedicated faithful temple attending member. The reason you’re told all the days of your Mormon life to stay away from “anti-mormon” literature is because they know you will start to question the church. They tell you not to question and to doubt your doubts. Church leaders don’t like your questions and if your told NOT to search out and seek answers to your legitimate questions that should be a huge red flag. You should be able to look at and question every viewpoint and every angle without having to fear you’ll see something that might lead you away from the church. Don’t be the blind follower they want you to be. I feel sorry for all the good Mormon people and family I have that still feel the need to defend the Mormon church. I doesn’t matter how you try to spin it or justify it, wrong is wrong and the Mormon church is wrong. But I do understand why you don’t leave. It’s hard (gut-wrenching) to see the church for what it really is. You will feel betrayed. It’s a long process of healing and it hurts me to see so many who leave the Mormon faith turn away from God and Jesus Christ all together. To say to I have been freed is an understatement. I am a firm believer and follower of Jesus Christ. My understanding of him is greater and closer than ever before. Thanks, MariLouise! I’m glad that some of what I write is helpful. In a way, it’s redemptive for me to know that some of the things I’ve struggled with are now transforming into a message of love and hope for others. We miss you and your family. I appreciate your honest comments and heartfelt convictions. We all have a long way to go and helping each other is the best way to get there. I appreciate all the help you and your family has been there for us. Thank You! Thanks, David! I agree–helping each other is the best way to move forward. It’s wonderful to hear from you, Heidi! Having dealt with depression myself, I’m really glad to hear that you’ve found contentment and happiness. It sounds like we can relate to each other about still having mixed experiences in attending church. Finding warmth and comfort in your husband’s love is a grace indeed, even if your questions remain unanswered. I talk a little about my own experience of those things in a few of my previous posts. Nice to be in touch with you! Thank you for sharing this with everyone, but especially me. I feel this way sometimes. Like I cannot ask questions or think people are judging me because I do not have the to this question yet, but everyone else seemingly does. This post really hit home with me and connect with me on many levels. I wish you the best in your endeavors and I cannot wait to read some more of your posts. Is there away to follow your specific blog. Like receive updates when you post a new one? I’m so glad that you connected with this message, Crystal. It’s SO important to know that we’re not alone. Per your request, I’ve added your email to my newsletter list; I usually send one out announcing new posts within a few hours of posting. I’m glad you signed up! We have a lot to learn from each other. If you want to receive inspiration to awaken to a more radiant, joyful, connected, and peaceful life, join us on this journey—simply enter your name and email below! © 2019 Paul Sigafus. All rights reserved.